I just received [Monday April 7, 2014] this important press release from the office of Senator Ted Cruz, R-TX with the subject line, Sen Cruz: This National Security Issue Transcends Political Parties. This press release shows that once again Senator Cruz is the one taking the lead on a major foreign policy and national security issue. And once again his leadership prevails, this time with unanimous support from his colleagues in the US Senate. 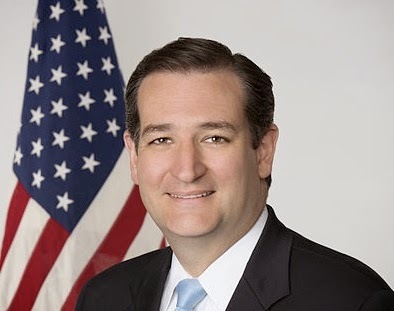 WASHINGTON, D.C. – Sen. Ted Cruz, R-Texas, today requested and received unanimous consent to pass his bill, S. 2195, which prevents terrorists from entering the United States as United Nations ambassadors. Recently, Iranian President Hasan Rouhani named Hamid Aboutalebi as the nation’s new ambassador to the U.N., which is headquartered in Manhattan. Aboutalebi was an active participant in the group that held 52 Americans hostage in Iran from 1979-1981. In his remarks, Sen. Cruz thanked several Senate colleagues who were instrumental in passage of this legislation, including Sen. Dan Coats (R-Indiana), a cosponsor of the bill, and Sens. Lindsey Graham (R-South Carolina), John McCain (R-Arizona), Mark Kirk (R-Illinois), Chuck Schumer (D-New York), Patrick Leahy (D-Vermont) and Bob Menendez (D-New Jersey). Rep. Doug Lamborn (R-Colorado) has introduced companion legislation, H.R. 4357, for consideration before the U.S. House of Representatives. Sen. Cruz is calling on the House to pass this measure before the Easter recess. Also, please view Senator Cruz web site here.